There are elements of life at St Andrews University that are quirky remnants of medievalism. They may seem delightfully twee to those of us who experienced university life in the urban fast lane; but equally, there is a sense of preserved tradition in St Andrews life, not least a sense of peace and quiet that calms the east coast breeze, and suggests a place of intellectual contemplation, where quality of life is foremost. Musically, the university has history. It’s Chapel Choir – originally known as the Choristi Sanctiandree – dates back to the founding of the university in the mid-15th century, and exists today to fulfil the core purpose for which was set up by Bishop Kennedy in 1450: to sing services – currently three a week – in the chapel of St Salvator, a building whose fortitude is reflected today in the visual scars of Reformation vandalism that still remain. That said, the past 27 years have been troublesome for music at St Andrews. In 1988, it’s music department, set up in 1947 under its only professor of music Cedric Thorpe Davie, came under threat five years after his death. The department was effectively axed and its senior team of academics transferred to Edinburgh University. That left a skeletal regime, under a part-time director of music whose key function was to maintain practical and general music-making provision for students. Well, things have since changed for the better. In recent years, the position has not only become full-time, but the current go-ahead director of music, Michael Downes, has expanded his role to encompass the artistic directorship of the Byre Theatre (part of the theatre’s recent rescue package); academic music is now back on the agenda, albeit part of the multi-disciplinary MA course; and there’s a real sense of creative energy in the university’s music centre in the Younger Hall, where the team is visibly in expansion mode and currently preparing for a production of Gluck’s opera Iphigenie in Tauris at the Byre Theatre (15-18 June). Through all this, the Chapel Choir has remained remarkably unscathed. And under it’s latest director, 30-year-old university organist Tom Wilkinson, it is sailing on the same high as the rest of the St Andrews musical renaissance. It recently returned from a tour of the United States, and is now preparing for June appearances at two festivals in The Netherlands. It’s likely that this renewed activity will have gone by largely unnoticed to anyone living outside the town, which is why the launch this month of a new record label – aptly named Sanctiandree – by the Chapel Choir is such a significant development. I travelled to Fife over Easter to attend the launch event – a concert in St Salvator’s Chapel of repertoire mainly from the debut disc, Salvator Mundi: The Purcell Legacy, focusing on music from the time of the English Civil War to the the reign of George III, and showcasing the choir’s emerging collaboration with the Fitzwilliam String Quartet, the university’s quartet-in-residence. Wilkinson’s red-robed choristers are immaculately-disciplined and commendably democratic in their use of soloists from within the ranks, which gave a renewed freshness to the 17th and 18th century verse anthems that dominated the programme. Alongside Purcell’s well-known Rejoice in the Lord Alway (more popularly known as the “Bell Anthem”), examples by Pelham Humfrey, Jeremiah Clarke and William Boyce demonstrated the range of musical personalities operating in this fertile post-Restoration period of English music, some of it pioneering, some of it more derivative. 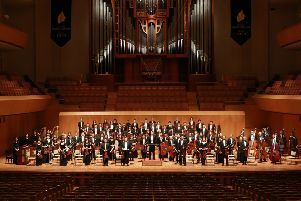 Most impressively, though, the full ensemble exuded a solid homogeneity in these performances – including a soulfully delivered early Bach Cantata (Christ Lag in Todesbanden, not on the CD) – that was charming in its youthful purity and directness of sentiment, and which lent itself neatly to the acoustics of the intimate chapel. Perhaps the most interesting performance was that of William Jackson’s Hear me O God, a work, with dazzling virtuosos soprano solo, dating from the late 18th century, which Wilkinson knew nothing about until he discovered a copy of it in the special collections of the university library. “I found it within a collection of 700 scores and books donated to the university by the composer Gerald Finzi, who was a close friend of Cedric Thorpe Davie,” says Wilkinson. Jackson was based at Exeter Cathedral most of his career, and as such was geographically isolated from the main centres of musical activity. “That may be why it is so individual in character, displaying surprisingly little influence from Handel, unlike so many typical works of its time,” explains Wilkinson, adding that “it may not be the best piece ever written, but it was fun to do.” It’s also fun to listen to, and makes for an exhilarating and intriguing final track on a stylish CD that Wilkinson also peppers with organ works by Handel, John Blow and Boyce. There are six-monthly plans for future discs, including a Bach CD this summer, one in January featuring music by the early-19th century Salzburg-born composer Sigismund Ritter von Neukomm, and a disc of Vaughan Williams in summer next year. With such an invigorating musical renaissance currently in progress, this latest initiative is a physical sign to the outside world that St Andrews is musically live and kicking. The history lives on.